Good instrumental metal is hard to come by and so the arrival of the second SardoniS album is a welcome surprise. The band have only two members and rely on creating as much noise, feedback and tripped-out grooves as possible in order to prove less is more. SardoniS have picked the perfect time to release this opus in the UK, having just opened for the kings of doom Saint Vitus. Wino’s various projects seem to have had a lasting impression on the band, with ‘II’ having more than it’s fair share of Vitus and Obsessed influences. Another band which are likely to draw comparisons are fellow hard rock instrumentalists Karma to Burn and there’s no denying that opener ‘Burial of Men’ bears some similarities to their vocal-less comrades. The opener starts with a wall of feedback and slow, grinding riffs which introduce SardoniS as a band that aren’t for the weak, adopting Motorhead’s louder is better policy. It’s on follower ‘Warmonger’ where the band come in to their own with a sound that has insanely catchy rhythms, accessible guitar work and thundering drums. The lack of vocals on tracks such as ‘Warmonger’ works to the band’s advantage, letting the riffs do the talking. It seems as if ever riff on ‘II’ has been carefully selected and those that won’t deliver maximum impact have simply been trashed. The minimalist nature of songs such as ‘Warmonger’ also work in the band’s favour, creating a no frills journey in to the very heart of blues rock. The tempo generally stays at one pace but interesting drum patterns make the aforementioned minimalism more interesting. 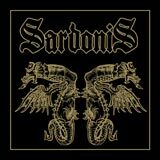 For an all instrumental album, it would be fair to presume that casual music listeners would need some patience but SardoniS have created an album that instantly draws you in with its merciless delivery. ‘Emperor’ is the first time SardoniS shake things up on the opus, with a gentle and soulful acoustic intro which melds in to an almighty super-riff. This collides with following track ‘Entering the Woods’ which is the SardoniS at their most crushing and to the point. The track titles on ‘II’ also do a good job of capturing the mood of each particular song. The finest example of this is album closer ‘The Aftermath of Battles’ which has a melancholic atmosphere that mentally captures images such as desolate wastelands and ruined monuments. SardoniS have finished off the package with typically bleak artwork which, again, revels in minimalism. A simple black background is decorated with two dragons, complementing the bands monstrous, mighty sound. Although SardoniS sound like many other bands in the sludge movement their vocal-less attack has allowed them to produce something which hasn’t been covered too heavily. The album is easy going by sludge standards and so has the added advantage of being enjoyable in a variety of different moods. SardoniS have found their own niche on ‘II,’ proving you can stray for the path whilst remaining accessible and infectious.